Semi-auto lower is precision machined entirely at Yankee Hill’s manufacturing facility from a high-strength 7075 aluminum alloy forging. The perfect foundation for almost any kind of AR you want to build: tactical, competition, sporting—even a non-standard caliber. Mil-spec dimensions ensure superior fit and maximum compatibility with a wide range of available uppers, aftermarket parts, and accessories. Slightly oversized magwell chamfers help ensure fast, positive magazine changes when the pressure is on. YHM logo stamped on left side of mag well. Accepts standard .154" hammer/trigger pins and .250" takedown/pivot pins. Pin holes are left slightly undersized, so you can open them up just the right amount for an exact pin fit without slop or slippage. Hardcoat anodized with a durable, fine-grain, mil-spec matte black finish. A2 Grip comes with polymer A2 pistol grip installed and is ready for you to add the receiver extension tube, buffer components, and buttstock of your choice. SPECS: Receiver - Forged 7075 T6 aluminum, hardcoat anodized, matte black. Accepts .154” hammer/trigger pins and .250” takedown/pivot pins. 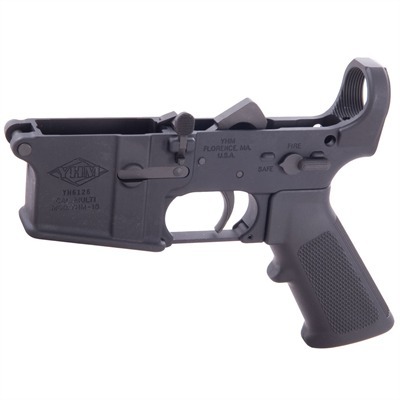 Pistol Grip – Reinforced molded polymer, black. FFL required for purchase.